Q. What is the New Jersey Boating Safety Certificate? A. The New Jersey Boating Safety Certificate is proof that you have met the mandatory boat safety education requirements for the State of New Jersey. The New Jersey Boating Safety Certificate is good for life and does not need to be renewed. A.The boating safety certificate is proof that you have successfully completed a boating safety course. The boating safety certificate does not expire and does not need to be renewed. The boat license is separate from the Boating Safety Certificate and is issued by the New Jersey Motor Vehicle Commission (MVC). The boat endorsement on your New Jersey driver’s license allows you to operate a power vessel on non-tidal (fresh) water in New Jersey. You must first obtain your New Jersey Boating Safety Certificate before the MVC will put the boat endorsement on you New Jersey driver’s license. Q. I do not have a driver's license. Can I still get the New Jersey Boating Safety Certificate? A. Yes. You are not required to have a state driver's license in order to obtain a boating safety certificate. Q. How can I get my New Jersey Boating Safety Certificate? Q. What is the Proctored Exam Voucher? A. The proctored exam voucher is generated once you have paid and completed the online course. The voucher allows you to take the proctored exam where you can obtain your New Jersey boating safety certificate. Q. How do I attend a proctored exam? A. You must schedule a proctored exam with one of the BOATERexam.com® partners in order to complete the certification process. Proctored exam providers are private companies, so be sure to consult with each company to determine individual fees and exam availability. You may only book a proctored exam once you have passed the online boating safety course. Q. Who needs a New Jersey Boating Safety Certificate? A. All boaters on New Jersey's waters are required to carry the New Jersey Boating Safety Certificate while operating any motorized vessel. For more information on boating safety certificate requirements consult the New Jersey boating laws and regulations. Note: While anyone can take the boater education course, students must be at least 12 years old in order to take the boater education exam for the state of New Jersey and must be 13 years of age to receive the New Jersey Boating Safety Certificate.. However, you are welcome to use this course as a study tool to learn more about boating safety! Q. How long is the boat safety course and New Jersey Boating Safety Certificate good for? A. The certificate is good for life. Q. How much does the boating safety course cost? A. There is a one-time fee of $29.95 paid to BOATERexam.com® for the proctored exam voucher. It includes unlimited free retries on all quizzes. Find out more about BOATERexam.com's Risk-Free Policy. Since the proctored exam is administered by a private course provider, there are additional fees for the final exam. Please consult with each private course provider for exam fees, locations and times. A. You need a grade of 80% or higher to pass each boating safety practice test. This means at least 8 correct answers out of each 10-question quiz. A. Yes, once you have completed the boating safety certificate test and submitted all your answers they are graded immediately. You have the opportunity to review all your Boater Exam answers, whether you have passed or failed the Boater Exam. A. Throughout the boat safety course, you can take end-of-chapter-quizzes that prepare you for the final exam. These chapter quizzes are short boater exam practice tests that cover the same topics that are present in the boating safety certificate test. Q. 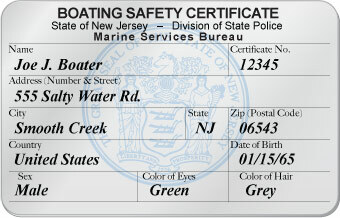 Is anyone exempt from obtaining the New Jersey Boater Safety Certificate? A. Yes, there are certain exemptions from the boat safety education requirement. For more information, check out the New Jersey Boating Laws page.